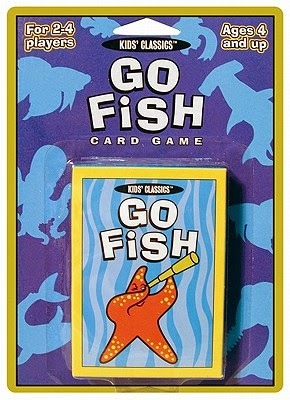 A Green Mushroom: Go Fish! One of the coolest parts of being a parent is watching your kids turn into fully functional human beings. I guess what I mean by that is watching them grow up. For so long you're stuck in state of constantly taking care of their every need. And they need a lot. But then, eventually, they start to do some things for themselves. They get better and better at doing things and then one day they are basically a fully functional, but little, human being. I bring this up to say that my daughter is four and it's awesome! She plays games with me on iPad and Wii U all the time. We just got her first console (that she's in charge of) for Christmas when we got her a 2DS. And now she's starting to play tabletop games! Yesterday I got home and was greeted with her asking, "Daddy, will you play Go Fish with me?" I'm trying to raise little gamers, so whenever she asks to play something I always say yes. And it was a blast! I love watching her as her mind processes the game and figures out what to do. She's slowly wrapping her mind around it and it's amazing to watch. Each new game she and her younger brother pick up is a step toward having a gaming family.